Next weekend, a unique event takes place in Denali State Park, combining the great outdoors with the world of painting. The "Plain Air Paint Out" takes place Aug. 15-17 at Byers Lake Campground at Mile 147 Parks Hwy. It&apos;s an opportunity to spend the weekend in the woods in a spectacular setting, while creating new artwork that shows off the beauty of the Denali area and the Alaska Range. Free camping is being offered through the Alaska State Parks for the night of Aug. 15 and Aug. 16 at Byers Lake Campground - there are 70 campsites, many of which have large pull-through sites. The nearby McKinley Princess Wilderness Lodge is offering special $99 rates if you mention participation in the event. On Saturday, artists will be exploring the park and painting the surrounding landscapes. There&apos;s easy access for painters at the access at the Denali View South wayside, the Princess Lodge and Mary&apos;s McKinley View Lodge. 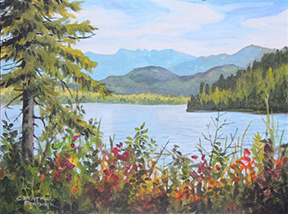 Throughout the day, there will also be hiking around Byers Lake, an alcohol ink workshop, a group art project, kids arts and crafts and a potluck dinner and art show in the evening. Alaska State Parks is organizing the event and will have a large tent with chairs for folks to gather, network and show off the artwork. Even if you aren&apos;t an aspiring artist, the event promises fun for the whole family. Take in a last blast of summer by camping and exploring in Denali State Park, and then pick up a brush - you may just find a new hobby.